My dear readers! You are such a talented bunch!! I look forward every week to the amazing projects you are going to share on Frugal Friday...and I am never disappointed. Next, Rooted in Love shared a DIY kitchen counter and backsplash makeover. And get this, she used spraypaint. No seriously. You HAVE to see this transformation to believe it!! Michele at The White House wanted a shabby chic church pew for her house...so she modified a thrifted bench. That's my kind of girl!! 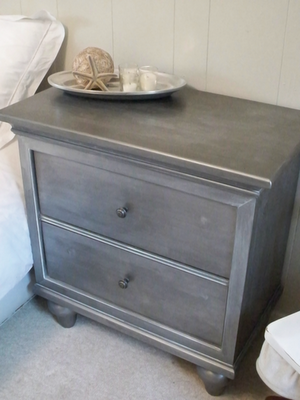 And finally, Jami at Freckled Laundry shared her faux zinc nightstand. Loved it! This is now on my to-do list. If you haven't had a chance to check out last week's Frugal Friday, do yourself a BIG favor and click here. Something fun on the agenda for tomorrow, so make sure and stop by!! Oh Wendy, thanks SOOO much for featuring my Dining Room Makeover. I love that faux zinc cabinet too. Thanks for sharing all the great inspiration. Thank you SO much for featuring my countertops. I was out of town all week and came home to find this and was just thrilled!!! Love your site and ideas! !